I've just finished my painting called 'House on the Hill'. It's a stormy day at dusk and the sky is closing in as rain starts to fall. 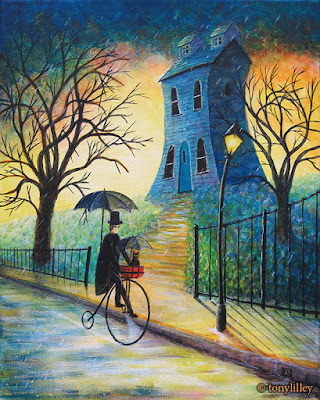 A spooky looking house overlooks the wet road and at that instant in time, from a bygone age, a man and his cat ride by on a Penny-Farthing bicycle. Painted in acrylics on canvas. Size: 20" high X 16" wide. SOLD on the 15th March 2018 at Hemingstone Frames gallery in Suffolk. Just 5 days after finishing it !